Today marks the 325th consecutive day that Chicago has gone without snow. Which, according to my favorite local weatherman, is 12.6-inches below average. And as someone who grew up here my entire life, it’s hard to describe how staggeringly unusual this is. During my childhood, you were lucky if you made it until Thanksgiving without snow. In fact, I remember having to bundle up in serious winter gear just to go trick-or-treating. But now, it seems as though the seasons are shifting. Extreme temperature fluctuations are now the norm rather than the exception, and the climate we’ve come to know is no longer. It’s unsettling. But despite the story the weather may currently be telling, the calendar says it’s January. Winter. And Brussels sprouts have always seemed like a wintery food to me. The way they shield their tender centers behind layers of leafy armor is reminiscent of how we bundle up for the cold on a chilly day. And when cooked just right, they can warm you straight to the core. *I like the bitterness that an IPA adds to a dish, but if that’s not your thing, try a lighter ale or a Belgian. Using a steamer basket or microwave, steam the Brussels sprouts for four minutes, then immediately shock them in ice water and let them sit for a minute or so to prevent them from cooking any further. Drain and pat them dry on a towel, then cut each one straight through the core. (Leaving the core intact ensures that the sprouts stay together when you cook them.) Set aside. Add the diced pork belly to a COLD wok or cast iron skillet, Turn on the heat to medium-high and start to render the fat. Cook until the pork belly is browned and crispy. Add the shallot and cook, tossing it with the rendered fat, until lightly browned. Add the minced garlic and cook for 30 seconds, being careful not to burn it. 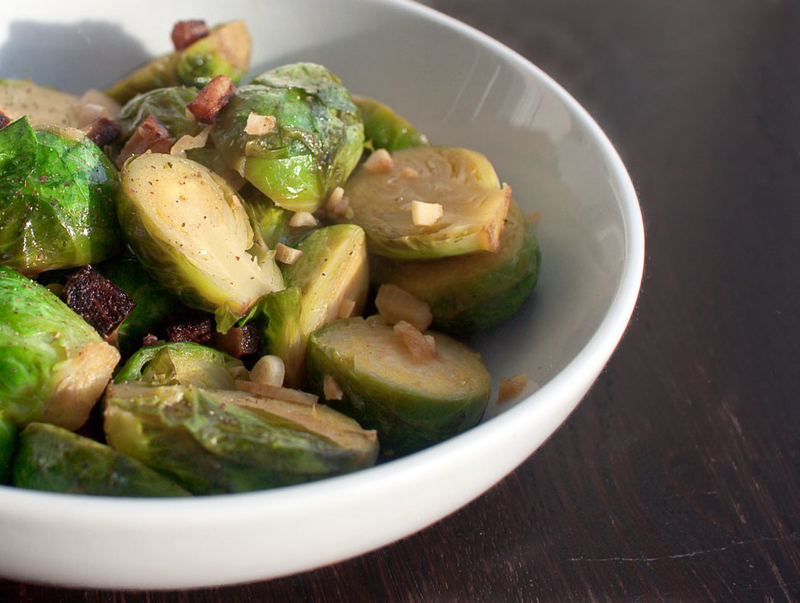 Add the halved Brussels sprouts and cook them with the pork belly, shallot and garlic until lightly browned, about three or four minutes. Stand back, add the beer, and use a wooden spoon to scrape the tasty brown bits off the bottom of the pan. Continue to cook until most of the beer has evaporated. Remove from the heat, season with salt and pepper and serve immediately. I love Brussels sprouts. And pork belly. And beer! That Anti-Hero IPA sounds pretty awesome, too.